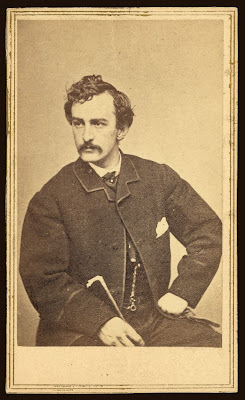 A common image of John Wilkes Booth, Lincoln’s Assassin. From the Library of Congress collection. For a long time I have devoted my energies, my time and money, to the accomplishment of a certain end. I have been disappointed. The moment has arrived when I must change my plans. Many will blame me for what I am about to do, but posterity, I am sure, will justify me. Men who love their country better than gold and life. When we think of history it is linear. One event follows the next tripping forward, action precipitating reaction. And so when the line loops around it provides a sense of historical congruence, a symmetry of understanding that while obvious, feels like puzzle pieces dropping into place. On April 14, 1865 a dashing young actor slid his way into a box at Ford’s Theatre and shot the President of the United States. History is complex, it is not pre-determined and is often re-written — for most Americans they piece the connections together not through primary documents, but through visits to historic sites like Ford’s Theatre, books like David McCullough’s 1776 (or the likewise named musical) and James Swanson’s Manhunt. Each provides a fragment of a history that is at times more real to those who are experiencing it then the facts that they are based on. Sometimes when each of these sources come together in an unexpected way it allows individuals, for a brief moment, to feel the texture of time. Portrait of George Washington by Gilbert Stuart. From the Library of Congress Collection. Though the book starts months before its self-titled year, 1776 looks at the first full year of the American Revolution through the actions and relationships of its most popular hero–General George Washington. It’s an unexpected story–one that does not anticipate the victory to come. On one level this is a portrait of a man leading an army for the first time, while on the other it is a look at those who fought in the rag-tag army at the front lines for Independence. But McCullough’s book has the feeling of uncertainty. Of a people struggling to understand who they are while fighting against a monarchy who had forsaken them. Of a people waiting for a signal for separation, or those unwilling to strip themselves of their nationality because of what they perceived to be a rabble filled minority. At the start of the fight in 1775, McCullough tells us, independence was not the rallying cry. 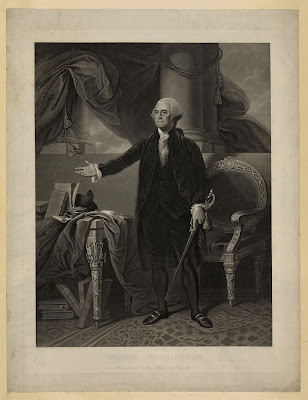 But he lays the groundwork first with Washington who upon hearing of King George’s speech of October 1775 (where the King declares the colonists in open rebellion) states “we were determined to shake off all connections with a state so unjust and unnatural. This I would tell them, not under covert, but in words as clear as the sun in its meridian brightness.” (McCullough, 68), and again months later “My countrymen…will come reluctantly into the idea of independence, but time and persecution brings many wonderful things to past, and by private letters which I have lately received form Virginia, I find Common Sense is working a powerful change there in the minds of many men” (McCullough, 112). But we learn of independence in McCullough’s 1776 the way the militia learns of it on July 6 and through John Hancock’s letter and instructions to Washington. McCullough emphasizes that though the declaration changed the tenor of the war, only a military victory could cement its possibility. John Trumbull’s Declaration of Independence (1818). Image from the Architect of the Capitol webpage. I finished 1776 five years after I acquired it at the National Preservation Conference in Pittsburgh where McCullough spoke about his hometown. A few weeks later I took my seat at the Ford’s Theatre to watch the path to independence again. This time though it wasn’t through the eyes of those in the field, but from the perspective of the men ensconced in a tiny room in Philadelphia…and in song. 1776 the musical would not concern itself with the whole year, but rather focused in on the hot summer months leading up to that world-changing decision. …until we reach the moment of truth on July 2, 1776. 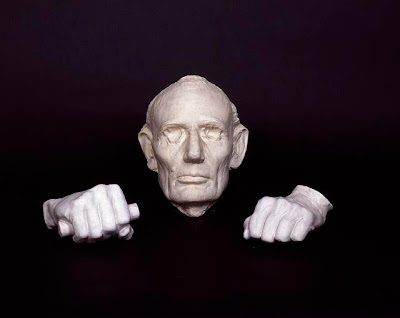 Life mask and plaster hands of Abraham Lincoln, preserved at Ford’s Theatre. From the Library of Congress, Carol Highsmith collection. I have never had a feeling politically that did not spring from the sentiments embodied in the Declaration of Independence. I have often pondered over the dangers which were incurred by the men who assembled here and adopted that Declaration of Independence -I have pondered over the toils that were endured by the officers and soldiers of the army, who achieved that Independence. I have often inquired of myself, what great principle or idea it was that kept this Confederacy so long together. It was not the mere matter of the separation of the colonies from the mother land; but something in that Declaration giving liberty, not alone to the people of this country, but hope to the world for all future time. It was that which gave promise that in due time the weights should be lifted from the shoulders of all men, and that all should have an equal chance. This is the sentiment embodied in that Declaration of Independence. Now, my friends, can this country be saved upon that basis? If it can, I will consider myself one of the happiest men in the world if I can help to save it. If it can’t be saved upon that principle, it will be truly awful. But, if this country cannot be saved without giving up that principle—I was about to say I would rather be assassinated on this spot than to surrender it. I read these words before the musical started, just steps away from the box where John Wilkes Booth shot President Lincoln in the head, and I have to admit I felt, for a brief moment a small shiver. I could feel the links from where I sat to the Civil War to the start of the United States. Something that could only happen at that time, in that place. On April 2, 1999 a Washington Post reporter David Montgomery re-traced the trail of John Wilkes Booth following this moment. He says: “Scrape away the accumulated gloss of advancing civilization — as provisional as a vinyl house in a pleasant subdivision in a field where Booth once contemplated eternal damnation — and the haunted history stares you in the face. 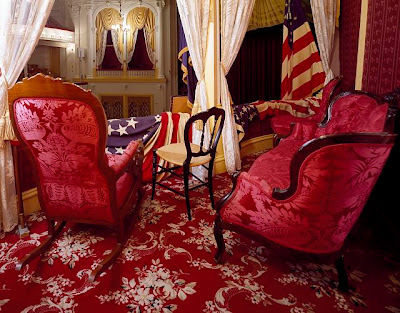 Lincoln Box, the box in which assassin John Wilkes Booth shot Abraham Lincoln during the president’s visit to Ford’s Theatre. From the Library of Congress, Carol Highsmith collection. And he’s right. You can’t tell this story anywhere else in the world, and that moment before and after Lincoln always starts with a gunshot in Ford’s Theatre. Again–I had read Manhunt months before sitting down where it all began and once again I could see where that past met my present. But seeing both pieces: Lincoln and Liberty, the continuing conversations about slavery over time–on paper and off–put things in perspective in a way that they never had before. So here we are, Independence Day 2012. As with every July 4, I watch fireworks, I honor those who fought and continue to fight for things that we believe in. I am a proud American. But I also look back, and think of the moments in our past where we saw our mistakes and fought to make things better. Where we came together or pushed through our differences to find life, liberty, and the pursuit of happiness. It was not easy, and it was not always peaceful, but how we live now is built on those broader struggles. I hope that fifty, a hundred, two hundred years from now someone else will be sitting in a darkened theatre and see where the pieces fit. I hope they will see how we worked, and fought, and sought to make this nation stronger and a more perfect union. Great post, Priya! I love the way you connect all the pieces together at Ford’s Theater backing them up with the extensive reading that you’ve done. What a super cool thing to be able to watch 1776 there. I’m jealous!